Properties in Vulkaneifel District average 4.6 out of 5 stars. Property 18: Comfort apartment Eifel flair in Wallenborn - on flowing Born 74 sq.m. Property 20: Attractive accommodation near the centre of the village. Property 21: Lovely holiday residence located in the heart of the Eifel. 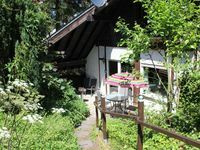 Property 26: A well kept holiday home for 2 people in the popular Eifel Volcano. Property 36: Modern property in lovely, immaculate white country house. Family-friendly 4 star holiday "Tapsi"
Property 39: Family-friendly 4 star holiday "Tapsi"
Property 43: A spacious accommodation in the Eifel countryside. Property 46: A spacious holiday home in the Eifel Volcano area. Property 48: Cheerful holiday residence in good state for exploring the exciting volcanic Eifel region.